Irving started his solo journey from Miami, Florida around the world. He made 27 stops to different countries including Canada, Portugal, Spain, Italy, Greece, the United Arab Emirates, India, Thailand, China, and Japan. He traveled 26,800 miles in 97 days and returned to his base on June 27, 2007. During his 150-hour flight time, he experienced challenges such as loneliness and bad weather. He would at some point feel frustrated especially for long stretches. But he kept going with the enthusiasm he received from the fans he communicated with over ExperienceAviation.org whenever he landed. He also got nervous when he encountered huge cloud formations and turbulence. Even before he embarked on the round-the-world trip, he had to face rejections from at least 50 sponsors he had been approaching for over 2 years. He said many have thought he was too young and inexperienced for his ambition. Later on, he received cash donations and even aircraft parts, which was used to build the single-engine Cessna Corvalis 400 plane he rode in his historic journey. He rightfully named it the "Inspiration." 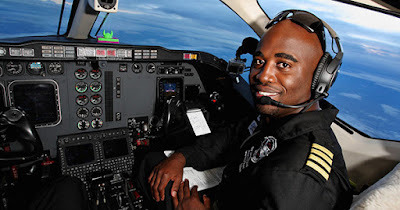 Irving, who was born in Jamaica and grew up in Miami, started his fascination with aviation and planes since he was 15 years old when a United Airlines pilot invited him for a tour at the cockpit of a Boeing 777 airliner. He then worked several jobs at airports and practiced with a computer flight simulator at home to enhance his skills. After high school, he was offered numerous football scholarships but he declined them all to pursue what he really wanted: an aviation career. In 2003, he received a $100,000 Florida Memorial University/U.S. Air Force Flight Awareness Scholarship and studied aeronautical science. In 2005, Irving established the nonprofit organization Experience Aviation to empower youth, especially minorities, to pursue careers in aviation. Moreover, Irving has been recognized for his determination to inspire others. He has been given the Jamaica National Honour, Order of Distinction Rank of Commander in October 2007 and has been inducted into the African American Research Library's Hall of Famous Black Achievers in Fort Lauderdale, Florida in November 2007. "It's humbling, especially in this day and age, when a lot of young black men are getting caught up in the wrong things," he told the New York Times. "I feel blessed that I had a chance to maybe inspire kids out there, black or white, to become pilots or engineers or air traffic controllers, or to make a positive impact in any other area of life."